"The actions of Tobias Forge amount to nothing less than unabashed dishonesty, greed, and darkness"
Earlier this week, it was revealed that four former members of Swedish metallers Ghost were suing the band's frontman for allegedly cheating them out of their shares of touring and album sales revenue. 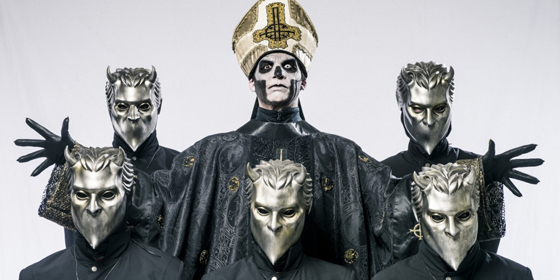 Now, the "Nameless Ghouls" have shared a public statement, in addition to their identities. Formerly Nameless Ghoul Simon Söderberg, who had played lead guitar in Ghost from 2010 to 2016, posted a lengthy statement to Facebook requesting that frontman Tobias Forge (known to fans as Papa Emeritus) "declare the incomes as well as expenses of the band concerning the years between 2011 and 2016." "Throughout all the years we have been on tour with Ghost (between 2011-2016 some of us have performed something like 500 shows with the band) and throughout the band's album recordings, we have neither been allowed to share in the profits of the band, nor have we seen any of the incomes accounted for," Söderberg wrote. He continued: "The only thing we have received have been minimal advance payments to allow the band to keep going. This despite the fact that we had an agreement that any profits should be shared fairly between the members of the band." Söderberg explained that Forge looked to have his former bandmates sign an agreement that "implies we are merely consultants working for his company," which would also see them "receive less than a minimal wage" for their work in the band, in addition to renouncing "any and all rights to music royalties." "Our vocalist and former friend is now attempting to, in a underhand and shameless way, transform Ghost from a band into a solo project with hired musicians. Naturally this is not something we can accept," the guitarist wrote. He also revealed that Forge has found himself a new group of "rented musicians" to partake in Ghost's current touring schedule. The other nameless ghouls involved with the lawsuit are identified in the statement as Mauro Rubino (Air, member since 2011), Henrik Palm (Ether, member since 2015) and Martin Hjertstedt (Earth, member since 2014). Find Söderberg's full statement over here.